I officially cancelled my Ipsy subscription last month. 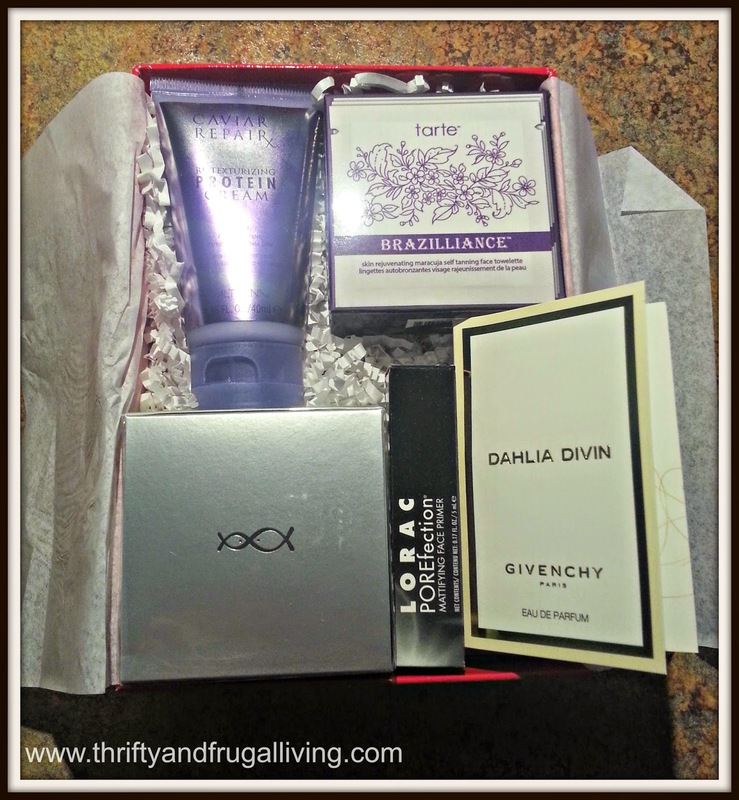 So, from here on out I will only be sharing the best with you: Glossybox and Sample Society. *Creation of Allure and Beauty Bar. Allure's Beauty Director is now selecting the products! *Each box comes with an insert describing each product, why Allure loves it, the full size price and even tips on how to use it. The products were almost too big for the box! *Tarte Brazilliance Maracuja Self Tanning Face Towelettes (3 Towelettes= $9): I'm NOT a fan of self tanner. What if you mess it up? Then you have to walk around orange for awhile...no Thanks. Plus, I would look funny with a tan face and pale body. *Givenchy Fragrance Dahlia Divin Fragrance Sample (1ml = arv $2.16): This perfume is a little strong, but I like it. It has some nice sweet notes in it. It also seems like it lingers on my skin for a decent amount of time. *Alterna Caviar Repair RX Re-Texturizing Protein Cream (40ml = arv $9.33): This is the pretty purple bottle that you can't really see in the pictures because it is so shiny. I LOVE Alterna. I haven't tried this Alterna product yet, so I am really excited to receive it. *Restorsea Revitalizing Eye Cream (FULL SIZE! $85): An $85 eye cream? Yes, please. I have used this eye cream already and I really like it. It goes on easily and has a cooling effect. It also comes with a cute little plastic spatula to get all of the product out of the container. *LORAC POREfection Mattifying Face Primer (5ml = arv $3.20): I am excited to try this. I have been using primer a lot more recently. This primer is supposed to keep your face oil free all day and that is an issue that I have. I do wish the sample size was a little bigger, but for everything else I received...I definitely can't complain. Wow! Definitely worth my $15 and then some. Everything in this box excited me except for the self-tanning sheets. Another outstanding month for Allure Sample Society. I hope they keep this up. 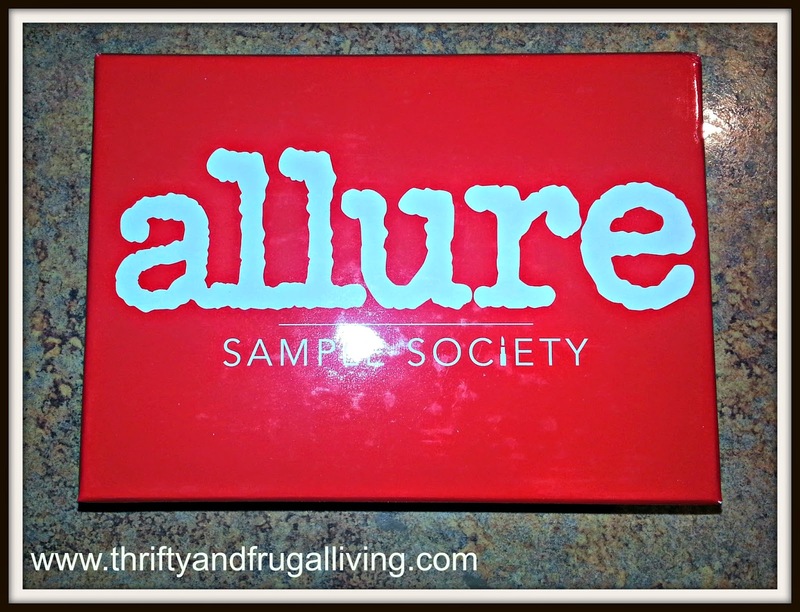 *Disclaimer: I am a paying member of Allure Sample Society. I share my boxes and my own honest opinion for the benefit of my readers. I used to have a subscription box addiction - literally getting a box almost everyday. I cancelled all of them and miss getting surprises in the mail. This one sounds great!! I miss my subscription boxes. This looks like a really great one. Lots of great items. I would love to see what you think of the Lorac primer. I love their stuff!